A woman who stole more than £22,000 from her grandmother to buy designer goods from Amazon has narrowly avoided jail. 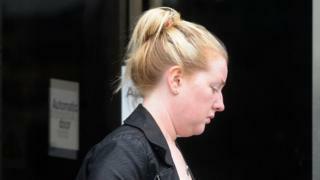 Nicole Spiers, 27, went on a four-month spending spree using 78-year-old Pearl William's bank account details. When the pensioner went to the bank to get cash, she was told she had "insufficient funds" in her account. Spiers, from Kirkintilloch, East Dunbartonshire, was ordered to perform 200 hours unpaid work. The sheriff told her that she had committed a "gross and obnoxious breach of trust" and, but for her guilty plea and that she has a young son with health difficulties, she would have received a jail sentence. Glasgow Sheriff Court heart that Mrs Williams discovered her savings were missing when she was unable to withdraw money from a Santander branch in Kirkintilloch in May last year. She was taken to a back room where it was explained that the money had been spent on payments to Amazon. Mrs Williams told her family and later received a text from her granddaughter. It said: "It was me who spent the money. I can't apologise enough, nothing I can say or do will make it better. I'm going to the police to hand myself in." She met her grandmother the following day and it was agreed she would repay the money in instalments of £200 but that never happened. Mrs Williams then reported the matter to the police. During a search of the house, officers found a number of expensive items including shoes, Gucci, Michael and Armani watches, Rayban sunglasses, a laptop, iPad and other electrical goods. But the court heard that less than £10,000 of the stolen money was recovered. Spiers made "full and frank admissions" when questioned by the police and admitted her guilt by letter to court after being charged. After performing her community work, Spiers will be supervised in the community for 15 months. Defence lawyer Michael Poggi said a small repayment of £200 was made and there was no obvious explanation as to why Spiers committed the crime.